HomeBrowse LibraryIs Your Small Business Ready for the Holiday Shopping Season? Each year, the holidays bring joy to millions of Americans, but they also cause quite the uptick in spending. With so many people ready to swipe their credit cards, it’s vital that small businesses are well-prepared ahead of time. During Thanksgiving week, there are three days dedicated to spending. 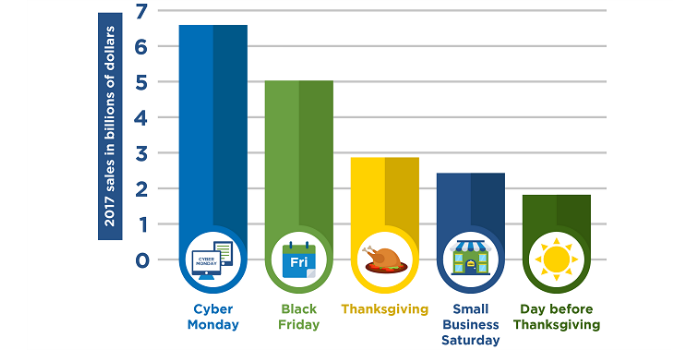 Last year, American consumers spent $6.59 billion on Cyber Monday, $5.03 billion on Black Friday, $2.87 billion on Thanksgiving, $2.43 billion on Small Business Saturday, and $1.82 billion the day before Thanksgiving. That’s an astronomical $18.74 billion dollars spent over the course of a single all-important week. Meanwhile, 43% of Americans also shopped or dined at local, independently-owned businesses on Small Business Saturday. So, what can your small business do to prepare for America’s holiday spending trends? If you don’t have an online presence, it’s time to create one. In 2017, ecommerce sales jumped 17.8%, mobile commerce (m-commerce) sales grew 40%, while foot traffic at brick and mortar stores fell by 7.5%. This spike in online purchasing should be all the incentive you need to get your website prepared for the opportunities presented by Cyber Monday, Black Friday and Small Business Saturday. Make sure your mobile site loads quickly. Conversions fall by 20% for every additional second it takes to load a mobile page. With more and more shoppers taking to their phones and mobile devices to make purchases, don’t lose customers by making them wait. Waiting is part of what drove them to your mobile site in the first place. Ask for reviews before the season starts. Not only do 96% of shoppers read reviews on retailer sites—many of them read more than one. If you haven’t started already, showcasing testimonials and highlighting positive reviews is a must. Surveys show that 94% of online shoppers use free shipping when it’s available, so pull people in by offering it as an incentive to buy. While sales will always be the biggest incentive to buy, free shipping is a convenience that most consumers don’t want to do without when buying online. Holiday shoppers buy an average of four gift cards, making them the second most-popular gift after clothing. With more than $27.5 billion being spent on gift cards annually, it makes sense to have them available at the holidays and all year long. The weekend after Thanksgiving offers small businesses the chance to showcase their brand and reach new prospects. If you prepare for the holidays accordingly, new revenue and repeat customers could be just around the corner. Do you need help figuring out a business strategy for the holidays? With over 10,000 volunteers nationwide, SCORE has the mentors to help your business succeed during the holidays…and beyond.